Located in downtown Honolulu, Aliiolani Hale is the current home of the Hawaii Supreme Court, court administration offices, a law library, and the Judiciary History Center. Constructed in 1872, it was the first western-style building in Hawaii built by the Hawaiian monarchy. 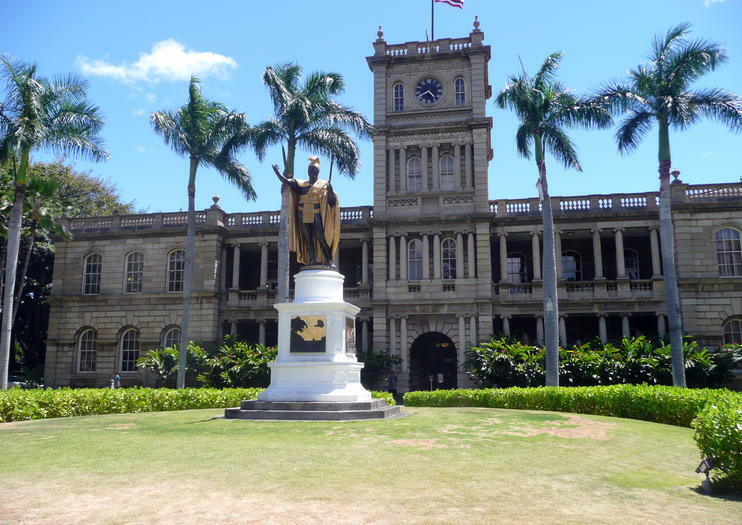 Aliiolani Hale was originally slated to be the Royal Palace, but ended up housing the Supreme Court and its legislative body. The building was the site of some of Hawaii’s pivotal historical moment, including the 1889 revolt by Robert Wilcox and over 100-armed insurgents. And, in 1893, the Committee of Public Safety overthrew the Hawaiian monarchy from here via a proclamation. Over the years, Aliiolani Hale has undergone renovations, and was spared demolition in 1937 when new renovation plans were approved. The bombing of Pearl Harbor in 1941 and subsequent declaration of Martial Law put everything on hold, and Aliiolani Hale became a center for military personnel. Once martial law was lifted, the building received a new wing and a second story several years later. During Aliiolani Hale’s centennial celebration in 1972, it was bestowed the honor of being placed on the National Register of Historic Places. Konceptet af denne tur blev skabt af to gange, New York Times featured tour guide Michael Pellagatti - og præsenteres af Michael (sæsonmæssigt) Dr. Kalani Young & hendes mand DanHidtil er dette den eneste tur i Honolulu for at diskutere Honolulas vækst som et bycenter midt i Stillehavet, sammen med byens utallige kulturelle og kunstneriske allegorier. De fleste af ture i Oahu går ikke dybt ind om arkitektur, historie og byplanlægning bag Honolulu - denne tur gør. Denne tour dækker også nogle af de mindre kendte historier bag byen generelt, som den uskadelige usurpation af Hawaii-rige i 1893, sukkerindustriens stigning, 1900-kinesisk fyrværkeri, 1940'ernes arbejdsbevægelse, 1970'ernes Hawaiian Renaissance Movement, Tyke elefanten undslipper cirkus og løber løs gennem Honolulu i 1994 og Honolulu fortolkning af Occupy Wall Street Movement i 2011.